A Comprehensive Guide. Micro Geckos. Its often the larger and more dramatic looking beasts that spring to mind when people are asked to think of reptiles. We live in a society where ‘Bigger is Better’ has become the mantra for many. If we turn our focus though, life at the opposite end of the scale can be truly fascinating. Many reptile keepers own small species of reptile but the true micros make these look like giants. Some of the ‘micros’ are so small they can hide inside a hollow stem no thicker than a match stick ! These remarkable creatures have all of the attributes and behaviours of their larger cousins but in perfect miniature. Their miniature world soon becomes captivating. Once you start keeping ‘micro geckos’ you will find you spend long periods observing life being lived to the full at the smallest of scales. Keeping ‘micro geckos’ creates opportunity for stunning display enclosures on the smallest of scales. They are ideal for any keeper with restricted space. Setup correctly, their enclosures can be low maintenance but like all other species these geckos need at least a few minutes attention each day. I am confident in saying that you will spend even more time watching these amazing reptiles. 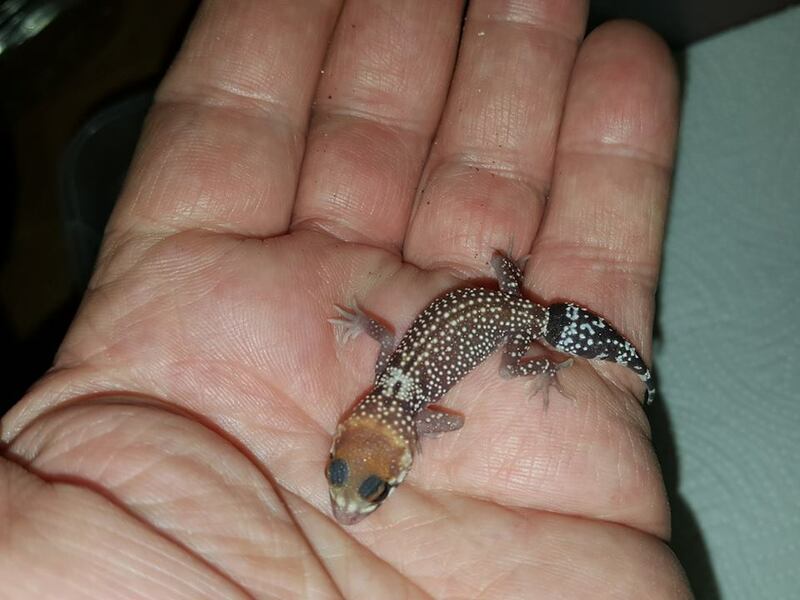 We have kept Micro Geckos for a few years but it is only recently that they have begun to achieve the popularity they deserve. Obviously we have shared the delights of Micro Geckos on our Facebook Page with many pictures and posts about the ones in our collection. However we believe one of the biggest factors contributing to the rise in their popularity is the work of Graham at Micro Geckos UK. Graham successfully keeps a number of species of ‘micro geckos’, a species list that exceeds ours. He has made ‘micro geckos’ his specialty and the prime focus of his reptile keeping hobby. Graham is every bit the hobbyist, truly fascinated by these miniature beasts, he has accumulated fantastic levels of knowledge and experience working with them. He has also worked to promote ‘micro geckos’ and willingly shared information to help others keep these tiny gems successfully. There are numerous species of ‘micro gecko’ and as already stated, Graham keeps a number of species that are different to those within the GG&S collection. Some of the care requirements are the same irrespective of the species of ‘micro gecko’ however each species also has its own specific requirements. In view of this we have collaborated with Micro Geckos UK to produce this care guide. The main elements of the care guide encompass the basic requirements of all ‘micro geckos’. This is followed by a number of species specific ‘mini guides’. Two stunning and very spaceous ‘bio active’ Micro Gecko enclosures. The Need for a Suitable Environment. Enclosure. The first challenge in regards to keeping ‘micro geckos’ is the need for an appropriate enclosure. Many of the ‘micros’ are natural born ‘escape artists’. These tiny geckos can get through the tiniest gaps or cracks. It is vital that you check the enclosure for your ‘micro gecko’ for any opening that it could fit through. If you choose to use a commercially available enclosure such as an ‘Exo Terra Nano Enclosure’ check your species of ‘micro gecko’ cant fit through ventilation slots, gaps between glass doors, the gaps between doors and hinges, cable ports etc. These are all possible avenues of escape. All potential escape routes need to be occluded before introducing a ‘micro gecko’ to its enclosure. Many keepers of ‘micro geckos’either buy specialist enclosures or construct their own escape proof enclosures. Some of the specialist tanks used by dart frog enthusiasts are perfect for ‘micro geckos’. Often referred to as ‘dendrobate tanks’ these specialist enclosures are designed to prevent the escape of feeder insects such as fruit flies. If the tank doesnt allow a fruit fly to escape one can rest assured that a ‘micro gecko’ would not be able to escape. Similarly, there are numerous enclosures available commercially that are designed to house invertebrates, again with the intent of preventing the escape of micro insects. Some of these ‘invert enclosures’ can be successfully used to house ‘micro geckos’. The other alternative is to make your own escape proof enclosures. These can be made from wood,plastic, acrylic, perspex or glass. A few basic DIY skills, a touch of ingenuity and a bit of imagination can be combined to make superb enclosures. It is even possible to adapt things like plastic tubs to make suitable enclosures. Fine mesh, a glue gun, silicone and a bit of trial and error can result in the ideal ‘escape proof’ enclosure. Some ‘micro gecko’ enthusiasts have gone a step further in adapting things to make suitable enclosures. One example being the use of something like ‘Moroccan Lanterns’to create a stunning eye catching enclosure. Providing the enclosure is escape proof, allows access for maintenance and the creation of the perfect environmental conditions there are lots of alternatives for the ‘micro gecko’ enthusiast. Obviously the enclosure needs to be of the correct size and orientation for the species housed. The arborial species of ‘micro gecko’ will require a vertically orientated enclosure with floor space being of greater importance for the more terrestrial species. Ventilation. Whatever type of enclosure you use, it is important that it has good air flow. However the standard sized vivarium vents are unsuitable for ‘micro geckos’ as they would provide an easy escape route. Very fine mesh is more appropriate for the ventilation slits in your ‘micro gecko’ enclosure. Heating. The heating requirements for ‘micro geckos’ is species specific. Some are better with enclosures heated by a small heat mat whilst others require a small heat lamp. A few of the ‘micro gecko’ species will thrive without any supplementary heating. It is vital that the use of any heat source is controlled by a thermostat and temperatures monitored with an accurate digital thermometer. Small enclosures can rapidly over heat resulting in the death of its occupants. It can be difficult to create a thermal gradient within these small enclosures so it is vital that you pay careful attention to enclosure temperatures. Lighting. Some of the diurnal ‘micro gecko’ species have a high UVB requirement whilst others being nocturnal or crepuscular have a lower demand for UVB. It is important that you research the UVB requirements for your chosen species. The use of an appropriate strength low wattage compact UVB bulb can in many instances provide the required levels of UVB whilst providing an appropriate level of supplementary heat. UVB bulbs can not be used in conjunction with a thermostat so it is again vital that accurate enclosure temperature monitoring is in place. Humidity. Again this is a species specific consideration. Some ‘micro geckos’ require a humid environment and the enclosure should be constructed of material that allows this. A humid environment can be achieved by light spraying of the enclosure once or twice a day. However care should be taken to ensure the enclosure does not become water logged. Some species however thrive in an arid environment. Your research should identify the requirements for your chosen species. Substrate. The substrate in your enclosure should be appropriate for the species accommodated. Eco earth or plantation soil is good for the species requiring higher levels of humidity. Some of the ‘micro geckos’ require fine sand for their substrate whilst others are better with a sand/ soil mix. Research will again help you identify the correct substrate for your chosen species. For the species requiring high humidity levels it is better if the substrate is placed on a drainage layer of hydroleca balls covered by a permeable membrane. Enclosure Furnishings. As with any other species of reptile, ‘micro geckos’ require places to hide, areas of shade and areas to bask. Cork bark and seed pods can make suitable hiding places. Pieces of vine root can can be used to create fantastic climbing and basking spots. The use of silk or plastic plants can provide extra areas of cover and shade and can be used to help create a ‘photo-gradient’ when UVB lighting is used. Bio Active Enclosures. ‘Micro Geckos’ are in most instances an ideal species for ‘Bio Active’ enclosures. In this type of enclosure, live plants and custodian insects can be used to create a mini ecosystem. The custodian insects act as a ‘clean up crew’ that helps break down excreta and uneaten food. This helps provide nutrition for the live plants. The live plants help maintain humidity levels whilst offering the ‘micro geckos’ climbing and basking spots plus areas for them to hide. Once the ‘bio active’ environment becomes established, the custodian insects will multiply and become more efficient in their ‘clean up’ duties. The tiny custodian insects such as spring tails and tropical woodlice will also serve as an additional food source for the ‘micro gecko’ colony. It is not unusual for ‘micro geckos’ to breed in such set ups with eggs hatching within the enclosure. Micro crickets – a good food source for micro geckos. Image credit – thespidershop.co.uk The Need for a Suitable Diet. Obviously a micro sized gecko is going to need a micro sized diet. This is a very important thing to consider before acquiring your first ‘micro geckos’. Many reptile shops do not stock feeder insects of a size small enough for ‘micro geckos’. It is worth discussing your requirements with your reptile shop to see if they can obtain appropriately sized ‘feeders’. Alternatively, you can purchase suitably sized ‘feeder insects’ from the main’on line’ suppliers of ‘live food’. Typical foods for ‘micro geckos’ are freshly hatched or 1st instar crickets. We prefer to use black crickets for our ‘micro geckos’ as the smallest sized brown crickets jump like fleas !! Bean weevils, roach nymphs, firebrats and fruit flies can also be offered. The custodian insects, tropical spring tails and tropical woodlice also serve as a food source, especially suitable for ‘micro gecko’ hatchlings. We dust all live food with a tiny pinch of Repashy Calcium plus. All live food should be appropriately gut loaded before being fed to your gecko. Hydration is an important element of your geckos diet. Many of the ‘micro gecko’ species will drink from the surfaces of foliage following enclosure misting rather than drinking from a container. If you do offer ‘standing water’ it should be in a very small shallow dish that the gecko can easily escape from. We prefer to use a milk bottle top as water dish for our ‘micro geckos’. Micro geckos may be small in size but their behaviour is just the same as their larger geckos. Sphaerodactylus elegans at GGS The Need to be able to express Normal Behaviour. Providing the enclosure is suitably furnished and the environmental conditions are correct for the species, your ‘micro geckos’ should be able to express behaviour similar to their larger cousins. Like all reptiles, they need to be able to ‘thermo-regulate’, to be able to bask or retreat into shade and to be able to move freely within their enclosure. If you do a bit of research, specific to your chosen species of ‘micro gecko’ you should be able to create optimal conditions for it to display all of its normal behavioural traits. Pygmy Tree Geckos. Good with each other but a convenient snack for a larger lizard. Need to be Housed With or Apart from Other Animals. We would hope that it is obvious that your ‘micro geckos’ should be kept away from other species of reptile. They would make a nice ‘snack’ for a larger species. Once again, research relating to your chosen species of ‘micro gecko’ should help identify whether it is appropriate to keep it in a group, paired or individual setting. Many of the ‘micro gecko’ species can be successfully kept in colonies. With some of the ‘micro gecko’ species if the number of females exceeds the number of males in the enclosure conflicts can be avoided. However with some species of ‘micro geckos’ the males are intolerant of another male within the enclosure resulting in fights that can result in serious injury or death to one or even both male occupants. If conditions in the enclosure are optimal, geckos kept within a colony setting will inevitably reproduce. If eggs are not harvested they will often hatch within the enclosure. This can eventually result in ‘over population’ of the enclosure requiring relocation of some of its occupants. It should however be noted that some hatchlings may be eaten by a hungry adult. The Need to be Protected from Pain, Suffering, Injury and Disease. The size of ‘micro geckos’ makes any form of intervention to alleviate health problems challenging. It is extremely difficult to offer such tiny specimens medication or treatments. In view of this, prevention of illness, disease or injury is preferable to attempting cure. For this reason it is vital that the correct environment, the correct diet and correct vitamin and mineral supplementation is vital. We would urge you to quarantine any new reptile, including ‘micro geckos’ for a period before placing them in proximity of your existing reptiles. When acquiring your ‘micro gecko’ check thoroughly for the presence of red mites. These are common in many species of wild caught ‘micro gecko’. In fact this is one of the reasons why we would recommend you choose captive bred over wild caught specimens. Many of the commercial mite treatments are too powerful for ‘micro geckos’ and will kill the gecko as well as the mites. If you do discover your ‘micro gecko’ has mites, obviously it should be quarantined . In our opinion the first line treatment for mites on ‘micro geckos’ should be the use of ‘predator mites’. The ‘predator mites’ feed on the red mites and their eggs and tend to eradicate the problem within a few weeks. Once the mites have been eradicated, the ‘predator mites’ food supply is exhausted and they die off. Treatment of internal parasites can be much more difficult with ‘micro geckos’. Wild caught specimens of ‘micro geckos’ often have an internal parasite load that does not cause them any problems providing environmental conditions within their enclosure are optimal. However precautions should be taken to avoid potential spread of parasites to any other reptiles in your collection. Rigorous hygiene standards should minimise such risk. Obviously if one of your ‘micro geckos’ becomes sick or injured you are still obligated to obtain appropriate help, including when required veterinary support. Unfortunately due to their size, treatment options can be very limited.